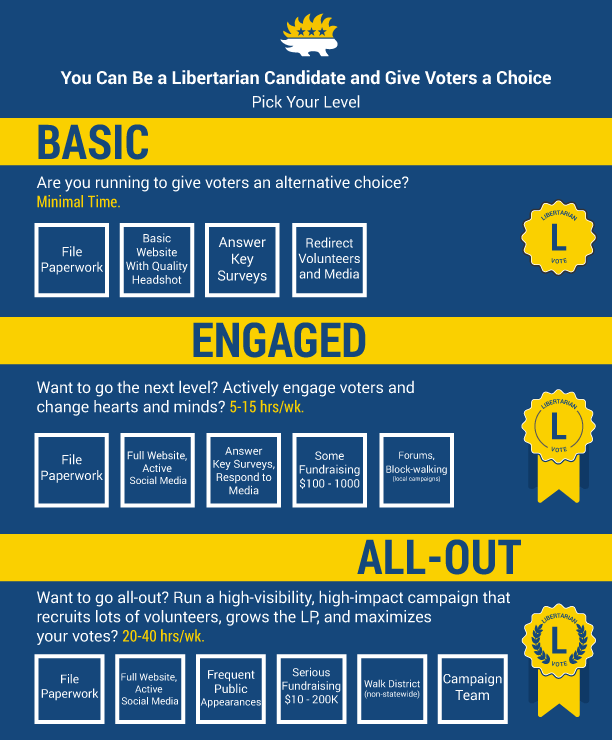 The Libertarian Party is a grassroots political organization. Most of the day-to-day work of our party and our campaigns is done by thousands of volunteers, candidates and elected officials working at the state and local level. Running for any office is hard work. A lot of forces will actively work against any candidate running for political office. We appreciate your willingness to run for office and continue to build a new political majority in America. If you are running for or interested in running for federal or state-level offices, visit the Libertarian Party of Indiana. Become a supporting member of the LPMC. Your membership allows you to vote at the County Convention. Become a member of the LPIN. This allows you to have voting rights at the State Convention. Even if you’re not running for a state-level office, you should still contribute. Tell us about yourself. You can notify county leadership online now. Candidates running most offices in Marion County will need to file appropriate election paperwork with the County Board of Elections and/or the Indiana Secretary of State. Learn more about that here before receiving more than $100 in donations.